Take your love of beer to the next level, and then 99 levels beyond that. 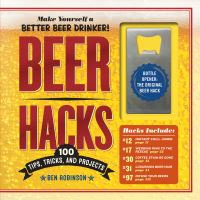 A book that celebrates not just the drinking of beer but the preeminent role it plays in the beer lover’s life, Beer Hacks is a tour de force of 100 ideas to make your beer-drinking life better, easier, more interesting, and, most important, more fun. Stuck without a bottle opener? Here’s how to pop one open with your wedding ring. Not married? Try the Bic Lighter method. Beer too warm to drink? Amaze your office friends by cooling it down in a minute by using that can of compressed air intended to clean your keyboard. (Feeling especially dramatic? Chill it down in 30 seconds with a fire extinguisher.) There are the only two beer recipes you need to memorise - Beer Can Chicken and Beer Brats. Seven DIY beer bottle projects, like turning your bottles into drinking glasses or repurposing them as tiki torches for your next party. Important life hacks: the only way to order beer at a sporting event; three tips for beer pong; how to pour a perfect pint of Guinness; the only thing you need to know to safely tap a keg; and the one true technique for shotgunning a beer. How to infuse your beers with new, wonderful flavours - fresh berries, or if you’re feeling really wild, s’mores - using a French press. Even four beautiful, easy beer cocktails, including the Black Velvet and Citron Shandy. (Though it does raise the question - Why make a cocktail when you have perfectly good beer? Beer Hacks answers that, too.) With step-by-step illustrations throughout (in the happy ironic style of an airplane safety guide) and including an emergency bottle opener on the front cover - for when you don’t have a wedding ring or a lighter on hand - it’s the perfect gift for the beer lover in your life. And you, too. 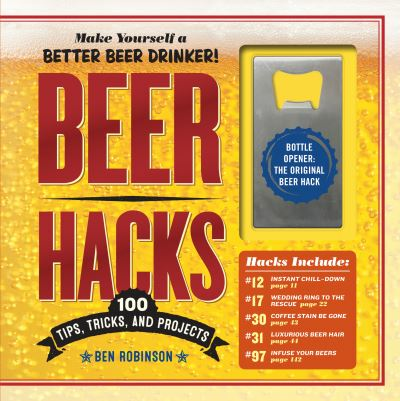 Beer drinking is about to get even more fun, with 100 inventive tips, tricks, projects and hacks for improving how you taste, store, serve, or save your brews (including fun projects that use the empty bottles). A gift for any beer lover, this book celebrates and appreciates their passion with a splash of fun and without taking itself too seriously.